Don't let his Knowledge slip by you. Truly, our name is Integrated Laser Systems, and that is what we do. We integrate both custom and standard lasers into manufacturing models. Steve Widencamp of Integrated Laser Systems was a primary reason that my NUBROIDERY innovation launched and prospered over the last two years. I could not have gotten here without him. I am one who has lots of questions. Steve not only answered them all but often opened the door for our incredible discoveries relating laser cutting technology. Meeting him changed my life and gave my domestic factories a huge edge on our competition. I guess what our greatest benefit that we offer a customer is obviously 25 years of experience in the industry helps a lot, but we're able to, they can present a problem or an issue to us. There's another company called... which makes woven or braided loom material, like you run wires through. It's a braided-looking loom that they run wires in. They were having an issue with cutting it. When they cut it it was fraying and coming apart. They sent us some of the stuff and we cut it with a laser and it cut perfect. Now, they're like, "Okay, we love the laser cut. It cauterized the edge of the loom material. Okay, so now we've got to integrate that into our manufacturing process. We want to hire your company to come in as an engineering consultant and help us integrate this laser cutting into our current manufacturing process." Whether you're a newcomer or a seasoned veteran in the use of the latest technology for cutting soft goods, ILS helps you increase the quality, reliability, and productivity of your operations regardless of size. Whatever your production needs, ILS supplies you with the very best in technology through its unparalleled knowledge, technical support, and maintenance.This is where ILS comes in with their expert advise...no other company has been cutting fabrics and textiles longer! To stand out as a team, you definitely need uniforms. You also need a team emblem, and of course, numbers for each uniform. Since 1998, Integrated Laser Systems (ILS) in Cleveland, Georgia, has been providing laser cutting services of finished uniforms and team clothing, as well as providing high-quality textile and a versatile laser cutting machine. 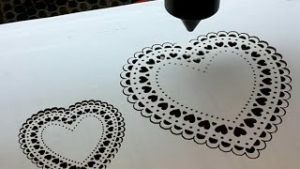 After the company spun-off from a leading European textile company, ILS began building its own flatbed textile laser cutters, created software to support these systems, and offered a “job shop” for customers who do not have their own systems. 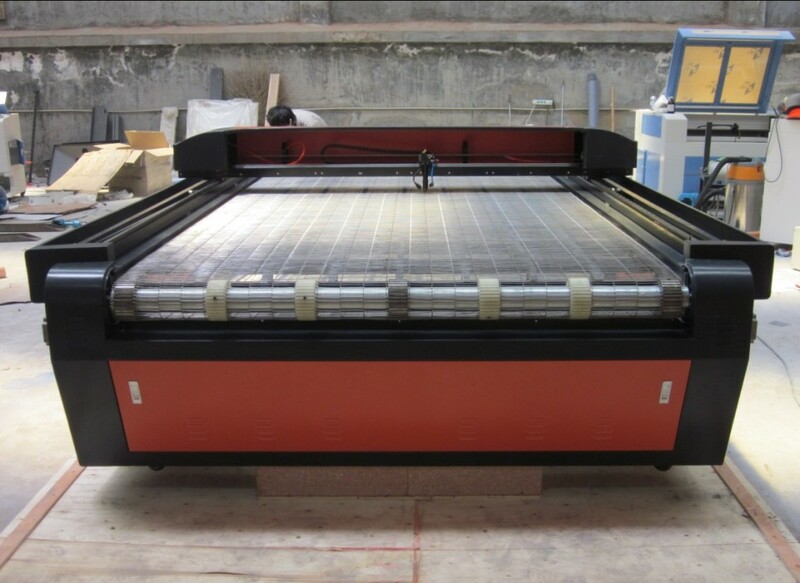 Currently, ILS has six flatbed laser cutting systems in-house that have 25 and 100 Watt lasers. For highly detailed customized cuts, the power levels can easily be adjusted. For example, one of ILS’s customers had a project involving an intricate design for a sweatshirt. The traditional method of constructing this design would require layering 40 separate pieces and hand-sewing the dye-cut fabric pieces together. By laser cutting the same design, not only were the cutting edges effectively sealed to prevent fraying, but also the required pieces were reduced to four. states Steve Widincamp, president of Integrated Laser Systems. “Laser cutting machines are far superior to other forms of digital cutting, and provides cleaner finishes, fused edges, is more accurate, and produces higher-quality clothing.” It has also been mandated by MLB for all their uniform logos. 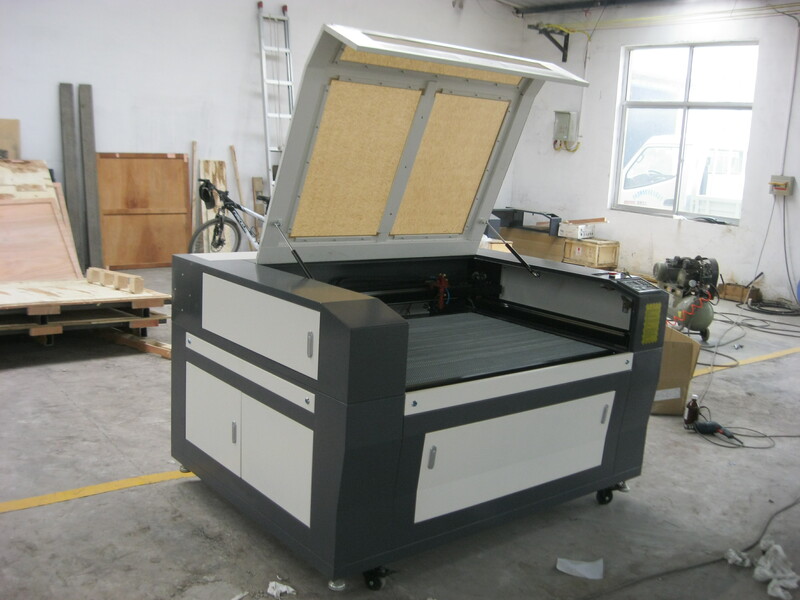 ILS’s laser cutting equipment has also allowed the company to be more flexible and serve a variety of markets. While many textile production jobs are going overseas, ILS is able to keep many loyal customers and gradually develop new business relationships. 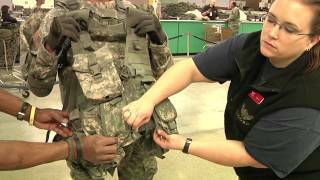 Integrated Laser Systems is currently laser cutting chemical suits for the U.S. military. All athletes expect their equipment to be of the highest quality. This high standard is achieved and delivered by the manufacturers who use sealed CO2 laser cutting equipment for custom engraving, marking and cutting of sports apparel. From the general sports enthusiast to the professional athlete, CO2 laser cutting equipment technology creates a more affordable way for anyone to custom mark their equipment, wear their favorite team uniform, or sail like a champion. ILS has been a major player in the laser cutting industry for over 20 years. During these years, ILS has revolutionized the kiss cutting industry through both its unique cut designs and its continually evolving machine designs. Many ILS machines are still operating after more than 20 years in the field. ILS maintenance and service is unparalleled in the laser cutting industry. The president of ILS, Steve Widincamp, provides prompt, professional, and expert service for every customer regardless of the size of the request. In addition, ILS provides maintenance and install service to meet your individual needs. ILS President Steve Widincamp has more experience with textile Fabric laser cutters than almost anyone in the industry. Steve’s work as one of the early leaders in the development of laser cutting machines in the textile industry puts him at the forefront of every significant advancement in this field. ILS will meet any design requests and can engineer innovative machine designs unique to your business’s cutting needs. ILS has been in the L.A.S.E.R. manufacturing business since 1998, its owner and president, Steve Widincamp, has been in the laser industry since its early inception in the 1990s, building his first textile laser cutting machine in 1990. During these years, ILS and Steve have revolutionized the laser cutting industry through the development of the kiss-cutting process in which the laser cuts the top layer of fabric while leaving the underlying layer uncut. This kiss-cut process has become the standard in many apparel industries including athletic industry and other industries with textile applications. In its Cleveland, Georgia shop, ILS has a number of laser cutting machines ranging in power from 25 to 200-watt lasers. Here, ILS offers cutting services to customers who create a wide variety of products in a diverse group of industries including, but not limited to, the apparel industry, the flag industry, outdoor sporting goods industry, specialty military equipment, technical textiles for the aerospace industries, on and off the field sporting goods industries, furniture, and decorating industries, and specialty medical industries, to name a few. On their own laser cutting machines, ILS can work with any customer to help develop and cut specialized orders in any size and quantity. While ILS got its start in the apparel industry, it has used its years of experience in cutting to design and builds its own industrial strength laser cutting machines. Today, ILS offers made to order CO2 material cutters in a wide variety of sizes and combinations from compact 25-watt systems to tables in excess of 14 feet long. The ILS team will build a machine that meets your individual production needs. Because you are buying from an American-owned and operated company, you can expect to receive immediate and easily accessible customer care at all stages of the laser construction process. In addition, Steve Widincamp and his team offer the expertise of nearly 30 years in the laser business—a record of success that is unparalleled in this industry. Truly, our name is Integrate Laser Systems, and that is truly what we do. We integrate lasers into systems. Well, to give you an idea we built a machine earlier this year. We had a customer that made insulation panels for Rayne, the hot water company Rayne. They make these little fiberglass insulation panels, it's quarter-inch think fiberglass insulation, and it had a pressure sensitive backing on it like a peel and stick, and what they did is they cut these out. They're all custom shaped and they cut them on a big, I think it was a Gerber. Big Gerber knife cutter was cutting these things, but they didn't know how to crack the back. "How do you crack the release paper on the back so I could peel it off?" Like a band-aid. You have to be able to peel the back of the band-aid stuff off. I said, "We can use a laser to do that." They're like, "Really?" I said, "Yeah. What we'll do is we make a conveyor and we just have a laser sitting there firing all the time in the middle that you just run these panels underneath the laser and it'll just cut the paper without cutting anything else." We ran samples for them and it worked perfect, so then we built them a machine to do it, and they run 10,000 pieces a day through that machine now. It's just for cutting the back side of that material so they can crack it? Yeah, all it's doing is cutting the release paper on the back to make a crack-back, so then they peel the release paper and stick it on the inside of this water heater. The thing is it had to be something like a laser because you can't crush the insulation because it loses the R value. They couldn't use a knife or anything that puts pressure on it. What I'm looking for is a Customer profile, who they are? There's a couple different standard customers. Let's say a standard machine customer for us is usually a small to medium-size company that is in some need of cutting textiles or specialty materials. When you say small to medium-sized company, can you define that for me? I would say 10 employees on the small side to couple hundred employees on the big side, and revenues ranging from half a million to ten million. But, we do make exceptions. These companies will now be in North America? Yeah, 90% of them are in North America. I could give you some examples of recent sales. We sold to a company called Polo Industries, and not to be confused with Ralph Lauren Polo. These guys have been around before Ralph Lauren was born, but they are based out of Iowa with manufacturing in Mississippi. They have manufacturing in Iowa as well, but they make products for handicapped people. They actually make the custom wheelchairs and all the custom components and padding or whatever they need. What they make is a lot of one of this and one of that and one of this. They don't do 10 million of this and 10 million of that. Where the laser came in for them was actually cutting these patterns of these one-off type pieces. It gave them incredible flexibility if they were dye-cutting everything. You can imagine having to make a dye for every pattern. It was just really expensive and time consuming. Hand to hand. Yeah, exactly. Then, you look at the other spectrum where we have customers like the one in North Carolina who's doing clean room work and they're cutting squares, clean room wipes, and he's running 18,000 pieces a shift. That's the polar other end of the spectrum where you're in a mass high production scenario. It's hard for a laser. We spoke with a company in Maine that works with L. L. Bean, and they do all L. L. Bean's cutting for them. They're looking at Integrated lasers for cutting simply because we have the conveyor system now with unwinds so they could put a large roll of fabric on there and then they can now run, "I want to run 5,000 shirts," or whatever pattern they want to run. Now, with the laser auto feeding we're actually getting to the point to where we're starting to be competitive with some of the traditional large-format knife cutters that have been around forever. Another customer, just to give you an example, this most recent deal we did is his company is called Rip-stop by the Roll, and he makes and sells pants and hammocks for backpackers. He cuts everything out of this really lightweight nylon, but we also found that we could use the laser to cut the poly-carbonate, or not poly carbonate. We're not just making the patterns for the pants and the hammocks, we're also making all the plastic hardware to put them together. Pretty interesting. That's a custom-built machine that's 72-inches wide by 14-foot long conveyor. ILS has over 25 years experience cutting fabrics and other materials with laser cutting machinery. In its Cleveland, Georgia facility, ILS machines custom cut a large variety of materials in any number of shapes and sizes. From lettering for sports jerseys to outdoor gear, automobile gaskets, and military equipment to articles for the aerospace industry, ILS can meet your laser cutting needs. Through its machines both in the field and in its own shop, ILS has extensive experience cutting for the military and aerospace industries. Their facilities and machinery are built to take care of the advanced materials and designs demanded by the defense and aerospace industries. ILS is fully versed in the technical and security requirements of these industries and will work to meet your company’s needs . Not sure what type of laser cutter works best for you and your business needs? ILS has the expertise and the equipment to match any cutting demands you may have. Just email or give Steve a call and he will help you find the perfect match for your company’s needs. Whether your business involves medical textile cutting, custom apparel, cutting for the automotive industry, or military designs and equipment, ILS is the cutting expert for you. ILS offers a number of laser cutting services on its in-house laser cutting machines. With more than 20 years of experience in the textile laser cutting industry, there are few laser applications that we have not seen. We have multiple machines with capabilities of kiss cutting as well as single and multi-layer cutting of a variety of materials including textiles, gaskets, medical fabrics, and technical textiles for a wide range of applications from the apparel industry to the automotive and military industries. If your business currently uses knife cutting or dye cutting, then a laser cutter may be a good option for you as you work to increase the quality and the efficiency of your manufacturing process. Whether you are new to the world of laser cutters or already have a great deal of experience with laser cutting, Steve Widincamp and the folks at ILS will provide you a fair, informed, and honest assessment of your existing and future needs in the world of laser cutting machinery. Our machines are equipped to cut a wide variety of textiles along with many other natural and human-made materials. Today, the machines we have in the field are cutting materials from the traditional twill or felt for applique to more advanced materials including Kevlar and other technical textiles for the military and aerospace industries. In addition to these textile applications, our systems are used to cut automotive door panels, and gaskets, along with other automotive parts made from plastics, paper, and other substances. 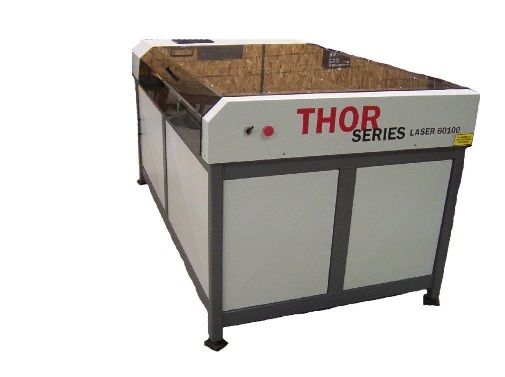 The latest technology has been incorporated into the Thor Series. Touch Screen panels are available with real time power and speed control. The frames of our machines are Jig Welded out of Steel. All of the machined components are made in the brand new state of the art CNC machine centers. All of the hardware in the machine is stainless steel. All steel parts are powder coated, and all aluminum parts are anodized. All shafts in the machine are stainless steel as well. All bearings are sealed for long life. The machines are fast, efficient, and easy to use. It requires no special tools to operate or repair. It can be operated by non-technical users, and job setup is minimal. The machine does require venting to the outside of the building. Our standard machines have an 18" x 24" or 36" x 36" cutting field. The larger format machine has a 36" x 60" cutting field. They can be built with most any size CO2 tube the customer requires. Our cutters come with 30-watt air cooled to 200-watt water cooled units. The Thor can be configured with a broad array of options to give it the ability to meet your specific requirements. ILS is also proud to introduce our proven Aegis line of cutters. These machines are custom-built and designed for the cutting and engraving markets. The machines are designed as a cost alternative to our Thor Series Machines. 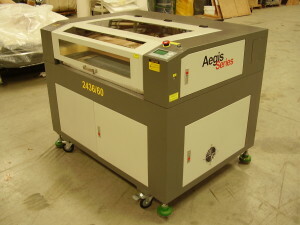 The Aegis Series Machines are a complete Laser Engraving and Cutter System. They also come with a One Year All Inclusive Warranty. On-Site Installation and Training are also available at additional cost. All Aegis machines are assembled in the United States and are products of ILS. There is a lot more experience and knowledge available when you talk with Steve!